Today, tech nerds are obsessed with high-tech encryption. But if you ever send snail mail, you might want to take a tip from America’s intelligence community. The CIA sends out letters that are secured with a specific type of tamper-proof tape—think of it like low-tech encryption—and we now know exactly what kind the CIA uses. When you file a Freedom of Information Act (FOIA) request with a federal agency, they’ll often send you physical letters in the mail. When I got my first response letter from the CIA, I was a little surprised to see some old-fashioned, anti-spy tech on the back of the envelope. 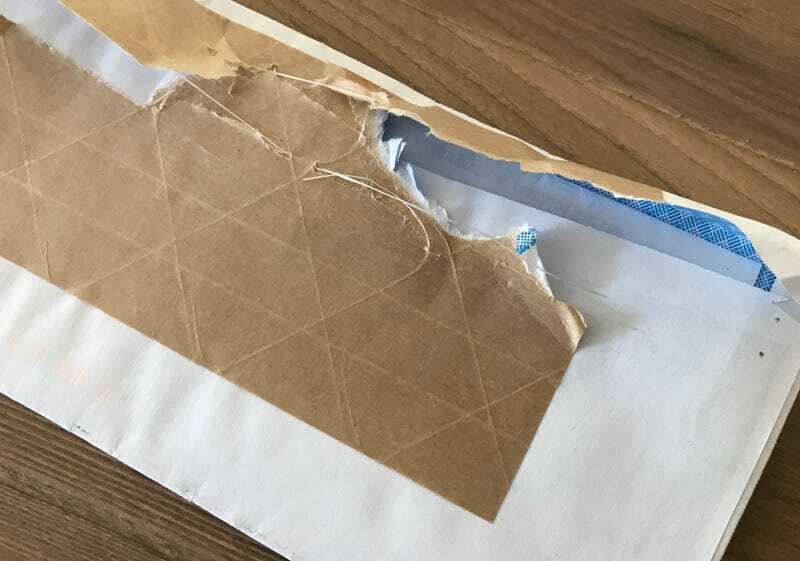 As you can see from the photos above and below, there’s no way to open the envelope without making it clear you’ve been messing with it. Comparatively, the FOIA response letters I get from an agency like the FBI are not only lacking any additional security, they’re sometimes hardly even sealed to begin with. After a fruitless search to find the precise kind of tamper-proof tape the CIA uses, I filed a FOIA request to find out what kind it might be. The agency responded by telling me that it didn’t have to say, arguing that this information wasn’t a specific “government record.” But “in an effort to assist me,” they told me anyway. I half-suspected that the tape, which can’t be steamed off and has laminated glass fibers, would be specially made for the CIA. (Like I said, I found a lot of tape that seemed similar, but nothing quite as sturdy as the CIA’s seals.) But it turns out that it’s just off-the-shelf tech that anyone can buy. The “gummed kraft sealing tape” the agency uses is three inches wide, and the indications from the response to my FOIA request suggest that the agency buys it in 450-foot rolls. The CIA even sent me a photocopy of the catalogue they order from—Miller’s Supplies at Work, Government Sales Division. The product number is UFS-44HD007. After September 11, 2001, the US government instituted high-tech monitoring of snail mail sent through the US Postal Service. Basically the front of every letter can be scanned and catalogued with the flip of a switch. In fact, there’s some evidence that the USPS might photograph every piece of mail that makes its way through their systems. But if you’re concerned about someone (the government or otherwise) tampering with the inside of your mail, you might do well to get a roll of this stuff. If it’s good enough for the CIA, it’s probably your best bet.